Each day, 850 water main breaks occur in North America. in total iron pipe corrosion costs. Plastic pipe’s foremost benefit for any project is its longevity. In 2009 research institutions Jana Laboratories, American Water Works Research Foundation, and Australia’s national science agency, analyzed, tested, and studied PE and PVC pipe manufactured in North America. The results concluded that PE and PVC pipe lasts more than 100 years. As an inert material, plastic pipe offers advantages unmatched by metal pipe. Results of the study noted that plastic pipe is resistant to corrosion and outside factors such as: chemical attacks, bacteria growth, and climate changes. 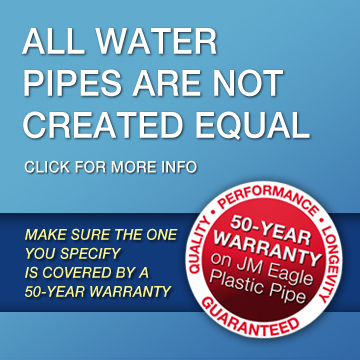 Both research studies reaffirmed plastic pipe as the material of choice for longevity. For the complete Jana Laboratories PE report, click here. For the complete American Water Works Research Foundation and Australia’s national science agency PVC study, click here. How Competition, Oversight, and Innovation Can Lower Water and Sewer Rates in the U.S.
"PVC Pipe: Lowest Failure Rate"
America’s population is expected to grow by 100 million by the middle of the 21st century. This growth will put enormous strains on the nation’s infrastructure, including roads, bridges, tunnels, and air-traffic control systems.